The genus Phallus, commonly known as stinkhorns, are a group of basidiomycetes which produce a phallic, often foul-scented, mushroom, from which their name is derived. The genus has a widespread distribution and, according to a 2008 estimate, contains 18 species. They belong to the family Phallaceae in the order Phallales. The best known species (and type species) is the common stinkhorn (Phallus impudicus). ... I am not sure that our Phallus falls within the class of the fungi. I will not definitely decide to place it there because I do not want to make a judgment before others who know more about the matter. The lightness, however, and looseness of the substance and (a necessary condition for the existence of sponges) the sour sap of the moist earth where it was born, all bear witness that it belongs to the family of the fungi. However, the folds and creases, which do not exist here, but do among fungi, bear witness against it. There is also no trace of the cap that is normally connected to the stalk. Here the hat takes the place of the cap, and it can be removed without damage. Moreover, the site where it lives also argues against it, because this plant can only be found in dunes, and only there where old marram grass grows. Fungi, on the other hand, as stated clearly by authors, live in swampy, dirty, and rotting moist places, such as close to the roots of oak trees. In 1753, Carl Linnaeus used the genus name Phallus in his Species Plantarum; the named was later sanctioned by Christian Hendrik Persoon when he used it in his 1801 Synopsis Methodica Fungorum. Some authors have considered the presence of an indusium (a lacy "skirt" that hangs beneath the cap) to be an important taxonomic characteristic, and have placed taxa with indusia in a separate genus Dictyophora. More recent publications suggest that there are close morphological similarities in Phallus species with and without an indusium, so the trend has been to merge Dictyophora into Phallus; the online taxonomic databases Index Fungorum and MycoBank consider Dictyophora synonymous with Phallus. According to the German mycologist Hanns Kreisel, who surveyed the genus in 1996, there are 33 species. Of these, 3 species are limited to the New World, 18 to the Old World, and another are 10 found in both hemispheres. His treatment divides the genus into five subgenera: Aporophallus; Itajahya; Endophallus; Satyrus; and Phallus. Spanish mycologist Francisco D. Calonge recognized 25 species in 2005, while according to the Dictionary of the Fungi (10th ed, 2008), there are 18 species. Recently proposed species (not accounted for by these publications) include P. maderensis (2008), P. luteus (2009), P. drewesii (2009), and P. calongei (2009). The immature fruit bodies of Phallus species grow underground, are roughly spherical to ovoid, and have a soft or gelatinous surface. Conspicuous white rhizomorphs extend from the base of this structure and help to anchor it in the soil. The outer tissue layer, or peridium, is white to pale, smooth, firm-membranous. The slimy spore mass, or gleba, is attached to outer surface of the cap, and is colored dark olivaceous to blackish brown. 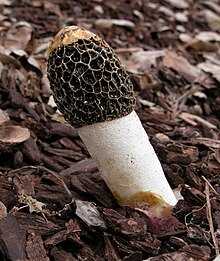 The stalks of Phallus mushrooms are called receptacles: they are upright, cylindrical, hollow, spongy, and bearing roughly bell-shaped cap with irregularly branching ridges on the outer surface. Some species have an indusium, a net-like structure that extends from the cap to the ground. The gleba is slimy and pale greenish-yellow; in several species the gleba has a foul, carrion-like odor, which attracts insects that then help disperse the spores. Mosquitoes, however, that feed on the gleba are killed, suggesting the fungus may contain compounds that could be used as an attractant or biocontrol agent. The spores of Phallus species are small, ellipsoid, and somewhat translucent (hyaline). The spores of various Phallaceae species, including P. ravenelii has been shown to be smooth and featureless using scanning electron microscopy. Roughened spore surfaces are considered by some mycologists to be an adaptation that results in friction during travel in the air, and increase dispersal distances. Phallus spores are not airborne at any time in their life cycle. The Yoruba people of Nigeria call stinkhorn mushrooms Akufodewa, a combination of the words ku (die), fun (for), ode (hunter), and a (search). The Yoruban name reflects the belief that hunters, smelling the glebal odor in the forest, may mistake the smell for a dead animal and search for it. Phallus mushrooms are also used by the Yoruba to prepare a charm known as Egbe, which reputedly "has the power of making one invisible in the face of danger." Stinkhorns are also used by the Urhobo and Ibibio people of southeastern Nigeria to prepare "harmful charms". They associate the fungus with the millipede, as is reflected in their names for the mushrooms: the Urhobo call it Uwovwi-rerivwi, from the Urhobo Uwivwi (house), re (of), rivwe (millipede); the Ibido name is Efoketim, from the Ibidio efok (house) and etim (millipede). The Ụkwụànì of Asaba, who associate the stinkhorns with death because of their smell, use the fungus to prepare "harmful charms and charms which confer immunity against evil attacks." They call the mushrooms Oga-egungun, from the Ụkwụànì oga (net or fence) and egungun (dead person). Phallus mushrooms are found amongst leaf litter in damp woodland with the rhizomorphs attached to buried wood. The genus has a cosmopolitan distribution, but with richer species diversity in tropical regions. Discovered on the western African island of Sao Tome. A new combination proposed in 2008 for the fungus formerly known as Dictyophora indusiata f. lutea. Found in Tanzania by Francisco Calonge and Hanns Kreisel and first reported in 2002. This species is a miniature Phallus (up to 1 cm tall) found in the Brazilian State Pernambuco. ^ Schaechter E, Wilson N. "Modern English Translation of Hadrianus Junius' 1564 work on Phallus hadrianii". A mycological voice from the past. Retrieved 2010-10-25. Note that this passage was translated from the original Latin, into Dutch, and then into English. ^ Linnaeus C. (1753). Species Plantarum. 2. Stockholm: Impensis Laurentii Salvii. p. 1178. Retrieved 2010-10-25. ^ Persoon CH. System Mycologicum Fungorum (in Latin). Göttingen: Apud H. Dieterich. p. 242. Retrieved 2010-10-25. ^ Pilát A. (1958). "Phallaceae". In Pilát A (ed.). Flora CSR B-1, Gasteromycetes. Prague, Czechoslovakia: Ceskoslovenské Akademie. pp. 50–79. ^ Liu B, Fan L, Li J, Li T, Song B, Liu J (2005). Sclerodermatales, Tulostomatales, Phallales et Podaxales. Flora fungorum Sinicorum. 23. Beijing, China: Science Press. ^ Andersson O. (1989). "Stinksvampen, Phallus impudicus, i Norden". Svensk Botanisk Tidskrift. 83: 219–41. ^ a b Kreisel H. (1996). "A preliminary survey of the genus Phallus sensu lato" (PDF). Czech Mycology. 48: 273–81. ^ a b Calonge FD. (2005). "Clave provisional para identificar las especies de Phallus" [A tentative key to identify the species of Phallus]. Boletín de la Sociedad Micológica de Madrid (in Spanish). 29: 9–18. ^ Sarasini M. (2005). Gasteromiceti epigei (in Italian). Vicenza: Fondazione Centro Studi Micologici. ^ Baseia IG, Maia LC, Calonge FD (2006). "Notes on Phalalles in the Neotropics". Boletín de la Sociedad Micológica Madrid. 30: 87–93. ^ "Dictyophora Desv". Index Fungorum. CAB International. Retrieved 2010-10-25. ^ "Dictyophora Desv. 1809". MycoBank. International Mycological Association. Retrieved 2010-10-25. ^ Kirk PM, Cannon PF, Minter DW, Stalpers JA (2008). Dictionary of the Fungi (10th ed.). Wallingford, UK: CABI. p. 520. ISBN 978-0-85199-826-8. ^ Calonge FD, de Sequeira MM, Freitas T, Rocha E, Franquinho L (2008). "Phallus maderensis sp. nov., found in Madeira, Portugal" (PDF). Boletín de la Sociedad Micológica de Madrid. 32: 101–4. ^ a b Kasuya T. (2008). "Phallus luteus comb. nov., a new taxonomic treatment of a tropical phalloid fungus". Mycotaxon. 106: 7–13. ^ a b Desjardin DE, Perry BA (2009). "A new species of Phallus from São Tomé, Africa". Mycotaxon. 101 (4): 545–47. doi:10.3852/08-166. ^ Moreno G, Khalid AN, Alvarado P (2009). "A new species of Phallus from Pakistan". Mycotaxon. 108: 457–62. doi:10.5248/108.457. ^ a b c Laessoe T, Pegler DN, Spooner B (1995). British Puffballs, Earthstars and Stinkhorns: an Account of the British Gasteroid Fungi. Kew: Royal Botanic Gardens. ISBN 0-947643-81-8. ^ Gardezi RA. (1992). "The fungus Phallus rubicundus: Possible attractant and bio-control agent for mosquitoes". Pakistan Journal of Scientific and Industrial Research. 35 (10): 409–10. ISSN 0030-9885. ^ Burk WR, Flegler SL, Hess WM (1982). "Ultrastructural studies of Clathraceae and Phallaceae (Gasteromycetes) spores". Mycologia. 74 (1): 166–68. doi:10.2307/3792646. JSTOR 3792646. ^ Oso BA. (1975). "Mushrooms and the Yoruba people of Nigeria". Mycologia. 67 (2): 311–19. doi:10.2307/3758423. JSTOR 3758423. PMID 1167931. ^ a b Oso BA. (1976). "Phallus aurantiacus from Nigeria". Mycologia. 68 (5): 1076–82. doi:10.2307/3758723. JSTOR 3758723. PMID 995138. ^ Rebriev YA, Pham THG, Alexandrova AV (2014). "Phallus coronatus sp. nov. from Vietnam". Mycotaxon. 127: 93–96. doi:10.5248/127.93. ^ Calonge FD. (2002). "Phallus minusculus sp. nova from Tropical Africa". Feddes Repertorium. 113 (7–8): 600–602. doi:10.1002/fedr.200290007. ^ Baseia IG, Gibertoni TB, Maia LC (2003). "Phallus pygmaeus, a new minute species from a Brazilian tropical rainforest". Mycotaxon. 85: 77–79. Retrieved 2010-03-26. Wikimedia Commons has media related to Phallus (fungus).